This Citrus Ginger Dressing has a a sweet, tangy ginger kick similar to oriental flavor. Your clients can use it as a salad dressing, meat marinade, dipping sauce, etc. 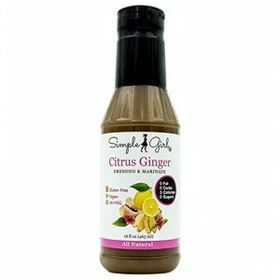 All Natural Citrus Ginger Dressing Ingredients: Filtered water, cider vinegar, lemon juice, dehydrated garlic and onion, salt, spices, natural flavors, stevia leaf extract, and xanthan gum (provides thickness).